Archbishop Michael with Fr. 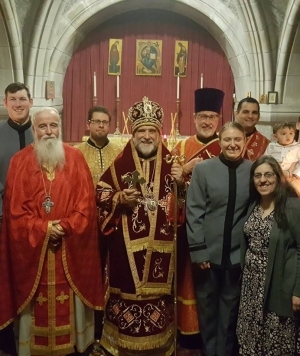 Joseph and Presvytera Irene Frawley and West Point cadetsOn Sunday, January 21, 2018, His Eminence the Most Reverend Michael, archbishop of New York and the Diocese of New York and New Jersey, presented a Synodal Gramota  to Archpriest Joseph Frawley, chaplain at the Chapel of St. Martin of Tours  at West Point, NY. The presentation, which was made at the conclusion of the Hierarchical Divine Liturgy, recognized Fr. Joseph’s 40th anniversary of ordination to the priesthood, 20 years of service as Chaplain at the U.S. Military Academy at West Point, NY, and his work at the Chancery of the Orthodox Church in America (OCA), both in the Department of History and Archives  and in the “Lives of the Saints”  section of the OCA’s website . The presentation was made at the conclusion of the Hierarchical Divine Liturgy. Father Joseph, a Master of Divinity student in the mid-’70s at the Seminary, has faithfully ministered at St. Martin Chapel and to the cadets it serves since 1998. During his visit, Archbishop Michael also presented a new antimension to the Chapel, containing the relics of the Holy New Martyr Saint Hilarion  [Troitsky], who fell asleep in the Lord in 1929. Sections of this article are reprinted from oca.org .